Costmary plant, Chrysanthemum balsamita, is also known as Alecost. The mint flavoured leaves were used in salads, soups and pot pourri. Formerly used in England to flavour beer and ale. In medieval England a sprig of Costmary was used as an aromatic marker in the Bible. 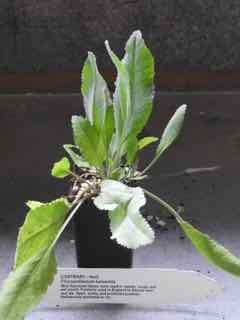 Costmary plant is native to Asia and is adaptable to most well drained soils. Prefers an open sunny, protected position. Daisy like flowers in summer. Frost resistant but drought tender. Grows to a height of 1m from the creeping rootstock. Be the first to review “Costmary, plant” Click here to cancel reply.